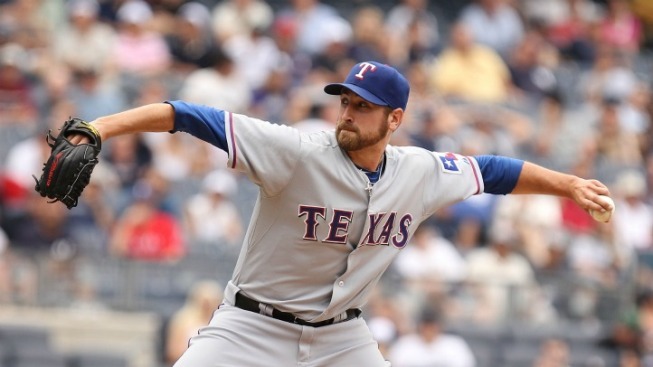 Michael Kirkman had, and blew, so many chances to make the Texas Rangers' big-league roster, he ran out of options and became a free agent after the 2014 season. After he failed to pick up any big-league interest, he signed a minor-league deal with the Rangers with an invite to big-league spring training after a short, yet successful stint in Arlington last September. Now, Kirkman's future with the team is in a little doubt after he experienced discomfort in his throwing shoulder following a throwing session over the weekend. "To make the club, it would be best for him to be out there and performing," Daniels told reporters in Arizona. "But we are early enough where if that's all it is, it's better to nip it in the bud now and give him a chance to compete." Daniels added that the discomfort is not considered serious. Kirkman was once a prime prospect in the Rangers' system but has so far failed to live up to that potential while showing a lively, yet wild arm. He shifted his focus last season to being a one- or two-out guy coming out of the bullpen against lefties, and posted a 1.59 ERA over 12 big-league appearances.